For the sixth year in a row, the Winship Win the Fight 5K Walk/Run raised a record level of cancer research funding. According to Winship Cancer Institute of Emory University, the event brought in more than $930,000. More than three thousand runners and walkers tackled the Peachtree Road Race qualifying course on Saturday, October 1st that started and ended on the Emory campus and wound its way through the surrounding Druid Hills-area. 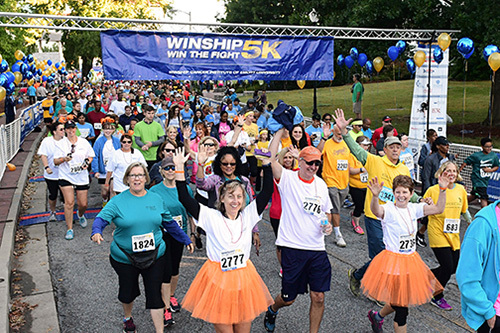 "We appreciate all the runners, walkers and volunteers who helped make the 6th annual Winship 5K an extraordinary success," says Walter J. Curran, Jr., MD, executive director of Winship. "The money raised will support cancer research projects at Winship and will help us to create more and more success stories in our fight against cancer." The Winship Win the Fight 5K is unique because it allows participants to direct their tax-deductible donations to benefit specific cancer research projects based on their personal interests. Donations will be accepted until November 15, 2016. For more information, go to: winship5K.emory.edu. The 7th annual Winship Win the Fight 5K will be held on Saturday, October 14, 2017.